The main economic reason that Denmark joined the EEC was because it wanted to safeguard its agricultural exports to the United Kingdom. Denmark formally applied to join the predecessor of the EU, the European Economic Community on 10 August 1961, a day after the British applied. But the then French president Charles de Gaulle vetoed British membership and Denmark did not wish to join the EEC without the United Kingdom. After much negotiation, and following a change in the French Presidency, Denmark, Ireland and the United Kingdom eventually joined the European Communities on 1 January 1973. Denmark and Ireland were so economically linked to the UK, that they considered it necessary to join the EEC if the UK did. The Danish population voted for membership with 63.3% in favour with a turnout of 90.1%. This was the first of several enlargements which became a major policy area of the Union. In 1982, Greenland voted to leave the Community after gaining home rule from Denmark. The EC became accepted and appreciated in Denmark and in 1986, an overwhelming majority of the Danish population supported the Single European Act. Danes spurred political awareness of euroscepticism and have enjoyed a reputation as "reluctant" Europeans. In Denmark, the first Danish Maastricht Treaty referendum was held on 2 June 1992 but a shortfall of fewer than 50,000 votes resulted in the treaty not being ratified. After the failure, alterations were made to the treaty through the addition of the Edinburgh Agreement which lists four Danish exceptions. The treaty was eventually ratified the following year on 18 May 1993 after a second referendum was held in Denmark. In October 2012, Prime Minister Helle Thorning-Schmidt demanded a 1 billion kroner rebate in the Budget of the European Union, otherwise she would veto against the budget. In February 2013, Denmark and the European Union reached an agreement on a seven-year budget, to approve Danish demand. On 25 May 2014, the Danish Unified Patent Court membership referendum was approved with 62.5% of the vote, enabling the government to proceed with the ratification of the Agreement on a Unified Patent Court, which constitutes the legal basis for the Unified Patent Court. Two political parties in the Danish parliament call themselves eurosceptic: the Danish People's Party and the Red-Green Alliance. Over the years, many anti-EU organisations have been established, for example People's Movement against the EU and the June Movement. In July 2011, Denmark reinforced its borders with Germany by stationing more officers in an effort to halt the flow of illegal goods. The action has angered both Germany and Sweden. Minister of Europe Joerg-Uwe Hahn in the state of Hesse called for a boycott of Denmark by tourists. He said "If Denmark is introducing border controls again during the holiday season, I can only suggest that people turn right around and holiday in Austria or Poland instead." The European Commission warned Denmark not to breach the Schengen Treaty. In January 2019 a poll suggested that 8% of the population want to leave the EU. Denmark uses the krone as its currency and does not use the euro, having negotiated an opt-out from participation under the Edinburgh Agreement in 1992. In 2000, the government held a referendum on introducing the euro, which was defeated with 46.8% voting yes and 53.2% voting no. The Danish krone is part of the ERM-II mechanism, so its exchange rate is tied to within 2.25% of the euro. Most of the large political parties in Denmark favour the introduction of the euro and the idea of a second referendum has been suggested several times since 2000. However, some important parties such as the Danish People's Party and Socialist People's Party do not currently support a referendum. Public opinion surveys have shown fluctuating support for the single currency with majorities in favour for some years after the physical introduction of the currency. However, following the financial crisis of 2008, support began to fall, and in late 2011, support for the euro crashed in light of the escalating European sovereign debt crisis. ^ This article incorporates public domain material from the United States Department of State website https://www.state.gov/r/pa/ei/bgn/index.htm (U.S. Bilateral Relations Fact Sheets). "Fact Sheet November 2011:The Danish Parliament and the European Union" (PDF). eu-oplysningen.dk. Retrieved 31 December 2012. "Danish Presidency of the Council of the European Union 2012". Retrieved 31 December 2012. ^ "Permanent Representation of Denmark to the European Union". Ministry of Foreign Affairs of Denmark. Retrieved 31 December 2012. ^ "Ambassadør Jeppe Tranholm-Mikkelsen". um.dk (in Danish). Retrieved 31 December 2012. ^ a b "Danish and British Popular Euroscepticism Compared: A Sceptical Assessment of the Concept" (PDF). Danish Institute for International Studies. Archived from the original (PDF) on 20 February 2011. Retrieved 31 December 2012. ^ "How the EU works, History, 1960–1969". europa.eu. europa.eu. Retrieved 31 December 2012. ^ "Denmark & EU". eu-oplysningen.dk. eu-oplysningen.dk. Retrieved 31 December 2012. ^ "The first enlargement". cvce.eu. cvce.eu. Retrieved 31 December 2012. ^ "Negotiations for enlargement". cvce.eu. Retrieved 31 December 2012. ^ Havemann, Joel (4 June 1992). "EC Leaders at Sea Over Danish Rejection : Europe: Vote against Maastricht Treaty blocks the march to unity. Expansion plans may also be in jeopardy". LA Times. Retrieved 7 December 2011. ^ "Maastricht-traktaten & Edinburgh-afgørelsen 18. maj 1993" (in Danish). Retrieved 22 February 2011. ^ "news.bbc.co.uk/2/hi/in_depth/europe/euro-glossary/1216944.stm". BBC. 30 April 2001. Retrieved 7 December 2011. ^ "Denmark and the Treaty of Lisbon". Folketinget. Retrieved 20 October 2011. ^ "No Danish vote on Lisbon Treaty". BBC. BBC News. 11 December 2007. Retrieved 20 October 2011. ^ "Denmark to review opt-outs". European Voice. 30 October 2009. Retrieved 20 October 2011. ^ "Thorning truer EU: Veto hvis ikke Danmark får milliard-rabat". DR (in Danish). 25 October 2012. Retrieved 9 February 2013. ^ "Denmark secures billion kroner EU rebate". Copenhagen Post. 8 February 2013. Retrieved 9 February 2013. ^ "MINISTRY: EU patent court may require referendum". Politiken. 7 May 2013. Retrieved 10 May 2013. ^ "Pressemøde den 7. maj 2013". Government of Denmark (in Danish). 7 May 2013. Retrieved 11 May 2013. ^ "EU-politik". danskfolkeparti.dk (in Danish). Archived from the original on 19 October 2010. Retrieved 31 December 2012. ^ "EU-politik". enhedslisten.dk (in Danish). Retrieved 31 December 2012. ^ "Neighbours: move toward border controls a "scandal"". Copenhagen Post. 12 May 2011. Retrieved 31 December 2012. ^ "Denmark steps up customs checks at borders". Reuters. 5 July 2011. Retrieved 31 December 2012. ^ "EU Slams Denmark over Plans to Reintroduce Border Checks". Der Spiegel. 12 May 2011. Retrieved 31 December 2012. ^ "Danskerne siger nej tak til euroen". Business.dk (in Danish). 27 September 2011. Retrieved 29 September 2011. The European Union is a geo-political entity covering a large portion of the European continent. It is founded upon numerous treaties and has undergone expansions that have taken it from 6 member states to 28, a majority of the states in Europe. Denmark uses the krone as its currency and does not use the euro, having negotiated the right to opt-out from participation under the Maastricht Treaty of 1992. In 2000, the government held a referendum on introducing the euro, which was defeated with 46.8% voting yes and 53.2% voting no. The Danish krone is part of the ERM II mechanism, so its exchange rate is tied to within 2.25% of the euro. A referendum on the Maastricht Treaty was held in France on 20 September 1992. It was approved by only 51% of the voters. The result of the referendum, known as the "petit oui", along with the Danish "No" vote are considered to be signals of the end of the "permissive consensus" on European integration which had existed in most of continental Europe until then. From this point forward issues relating to European integration were subject to much greater scrutiny across much of Europe, and overt euroscepticism gained prominence. Only France, Ireland and Denmark held referendums on Maastricht ratification. 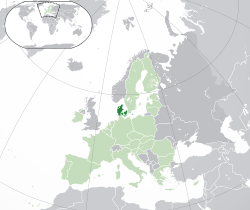 A referendum on joining the Eurozone was held in Denmark on 28 September 2000. It was rejected by 53.2% of voters with a turnout of 87.6%. A referendum on the Maastricht Treaty was held in Denmark on 2 June 1992. It was rejected by 50.7% of voters with a turnout of 83.1%. The rejection was a blow to the process of European integration, although the process continued. The result of the referendum, along with the "petit oui" in the French Maastricht referendum signaled the end of the "permissive consensus" on European integration which had existed in most of continental Europe until then. This was expressed by Pascal Lamy, chef de cabinet for Jacques Delors, the president of the European Commission, who remarked that, “Europe was built in a St. Simonian [i.e., technocratic] way from the beginning, this was Monnet’s approach: The people weren’t ready to agree to integration, so you had to get on without telling them too much about what was happening. Now St. Simonianism is finished. It can’t work when you have to face democratic opinion.” From this point forward issues relating to European integration were subject to much greater scrutiny across much of Europe, and overt euroscepticism gained prominence. Only France, Denmark and Ireland held referendums on Maastricht ratification. The Edinburgh Agreement or Edinburgh Decision is a December 1992 agreement reached at a European Council meeting in Edinburgh, Scotland, UK, that granted Denmark four exceptions to the Maastricht Treaty so that it could be ratified by Denmark. This was necessary because, without all member states of the European Union ratifying it, it could not come into effect. Denmark had first rejected the Maastricht treaty, but with the addition of the Edinburgh Agreement, ratified the treaty in a 1993 referendum. The member states that had already ratified the Maastricht Treaty did not have to do so again. 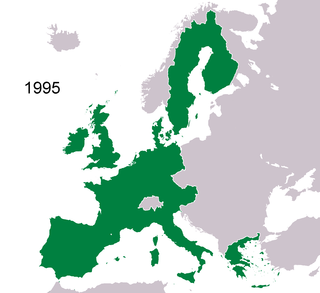 The history of the European Union between 1993 and 2004 was the period between its creation and the 2004 enlargement. The European Union was created at the dawn of the post–Cold War era and saw a series of successive treaties laying the ground for the euro, foreign policy and future enlargement. Three new member states joined the previous twelve in this period and the European Economic Area extended the reach of the EU's markets to three more. A referendum on one of the country's opt-outs from the European Union was held in Denmark on 3 December 2015. Specifically, the referendum was on whether to convert Denmark's current full opt-out on home and justice matters into an opt-out with case-by-case opt-in similar to that currently held by Ireland and the United Kingdom. Approval of the referendum was needed for Denmark to remain in Europol under the new rules. However, it was rejected by 53% of voters. Since the foundation of the European Communities, the United Kingdom has been an important neighbour and is currently a major member, until its withdrawal.